At an altitude of just 82 m above sea level, the CAI Mario Premuda Mountain Hut is located a few minutes by car from the centre of Trieste, at the entrance to the Rosandra Valley. And this is only one example of the great love that locals have for the mountains. 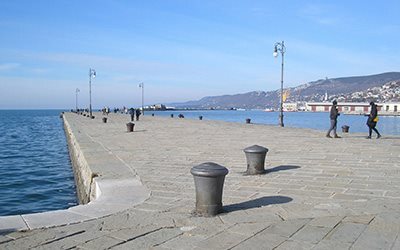 In fact, Trieste residents often lead a double life, dividing their time between the mountains (enjoying mountaineering, downhill skiing and ice climbing) and the sea (sailing or windsurfing). Ask around and you will be surprised to find that someone you meet fishing on the Barcola shore can rattle off the names of mountain peaks, high altitude mountain huts and normal routes (for ascending peaks) and provide suggestions and information on trekking in the nearby Julian and Carnic Alps. The mountains are in Trieste's soul - despite being a port, the city is home to two branches of the Club Alpinistico Italiano (Italian Alpine Club) or CAI. This great love for the mountains means that mountain enthusiasts who visit Trieste expecting to watch sunsets over the sea find that they can also enjoy surprising activities like multi-pitch climbing, trekking and even climbing via ferratas (fixed-rope climbing routes). In addition to its passion for mountaineering, Trieste has an important sports climbing tradition, with numerous bolted cliffs - often with breathtaking views of the sea - and indoor climbing gyms, as well as a continually growing number of free climbers, including youths. Climbers visiting the area can enjoy the cliffs scattered throughout the province and also take advantage of climbing opportunities in neighbouring Slovenia and Croatia (particularly Istria), two countries where the sport is extremely popular. In fact, climbers from Trieste often make use of nearby cliffs in Slovenia and Croatia (and vice versa), without paying much attention to the country where they are located. As a result, such a confusion of languages is spoken on these cliffs that it is easy for climbers to forget where they are. Seaside mountaineers From robust bearded men like Julius Kugy and handsome men in knickerbockers like Emilio Comici to tough, non-conformist women like Tiziana Weiss, Trieste has seen its fair share of great mountaineers. A sea of rocks The "Napoleonic Way" (Strada Napoleonica) is a scenic walk overlooking the city: for many, a popular place for a stroll after Sunday lunch.